Never done a 40K inquisitor warband before. To be honest, never really felt the urge to do it. Not exactly sure why. Maybe because everyone and their mother is doing inquisitors. But now I'll need such a warband for an Inq28 game in Belgrade in November, so it's time to finally give it a try. Btw, the Belgrade event is open for anyone to apply, and if you're in the region and interested you can find the FB event here: LINK. Given how much time I have for this project, I decided that it will be a small elite group. Also, I want each character to be unique; a different archetype. That way I can have fun and include a variety of visual elements I like from 40K. Coherence will come mostly from the colour scheme and unified painting style. I have no backstory for any of them yet. Will develop it as I work on them. Three members are sketched out so far. If I come up with more, cool. If I don't, these will do. Plus maybe a servo skull. I'll dedicate a separate post to each of them. 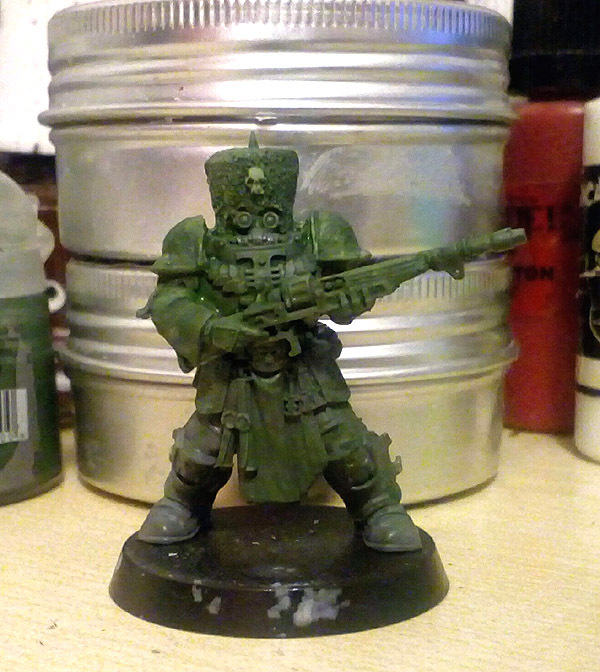 This one is about the first of my inquisitorial henchmen: a Vostroyan Firstborn Guardsman. Vostroyans are cool. I first encountered them in WD 317, one of the very few issues of White Dwarf I've ever purchased. 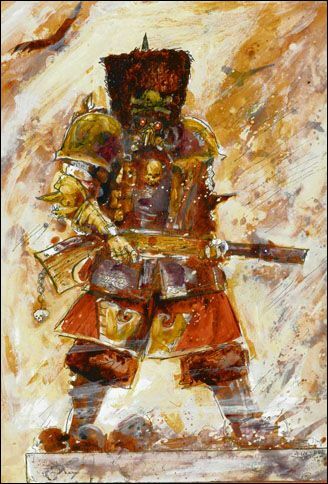 Metal Vostroyan guardsmen were released then, and the magazine featured an article about them, complete with fluff and John Blanche's concept art. I remember that I liked them the minute I saw them. From the article, I learned that Vostroya is an inhospitable planet whose inhabitants are dedicated to manufacturing exquisite weaponry for the Emperor's armies. During the Horus Heresy, they refused to send their men to battle, reasoning that they would be of better use crafting weapons than using them. 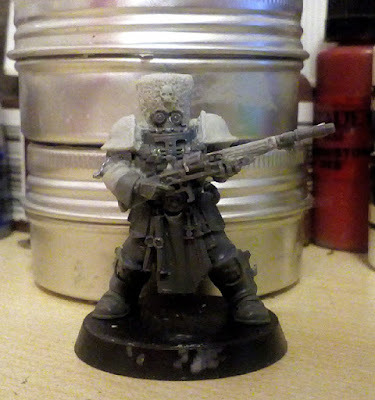 When the whole Heresy thing was over, this came to light; and in order to repay their perceived debt to the Emperor, it was decreed that for the next 10K years each Vostroyan family must enlist their first-born son into the Vostroyan regiments. The Vostroyans sport a unique, archaic look based on 18th century soldiers and Cossacks. © Games Workshop. Used without permission. Then it came to painting. Originally I figured I'd just paint them my usual style... But then I thought: hell, this is full on Inq28. I may as well push this further. How about I make him look even more like the Blanche concept art he's based on? So here we are. Emulating the style and palette was both fun and educational. It's messier than what I normally do. I really like the result! Even made him a matching background for photos. :) I'll do the rest of this warband the same way. He's awesome - I didn't realise how big he was until I read the bits-list. I think I "misread" the base as a 25mm but I see it must be a 32mm now! Very cool - I look forward to seeing the next member of your retinue now. Thanks! Yeah, he's quite big for a guardsman. Excellent job of capturing Blanche's style! I always love when people manage to translate that well from flat drawings/paintings to actual minis. Nailed it! It will be interesting to see the scale between him and a normal guardsmen! Amazing work, as always! Wow, that is an amazing rendition of that John Blanche art. I haven't seen many Vostroyans used in Inquisitor warbands, so this is already shaping up to be a visually striking project. I also agree with everyone above that it will be interesting to see this hulking Vostroyan next to the other members of the retinue. Thank you! I think he'll actually end up being the shortest of the bunch (not counting the servo skull). Wow, that is stupendous. The messy painting style to match John's sketch is spot on, and while it will not be to everyone's taste, it is very evocative. Pretty impressive work. You made it work, looks as it was designed that way, simply perfect. Wonderful build and the painting is spot on. Very cool! lovely conversion and paintjob! It's a really good conversion using some surprising parts, and I'm impressed how well you've captured the feel of the drawing. Can I ask what the layer of green paint in the second picture is/does? Thanks! Thanks! The green is a wash of Liquid Green Stuff + water. It evens out the texture and reveals any mistakes that I can't see due to the plastic and various putties being different colours. So, it blends everything together and allows me to more clearly see what I've done. On this particular model I also stippled some areas, such as the shoulder pads and the back of the torso, with undiluted liquid green stuff. This gave them a grainy texture that I needed for my glazes to work the way they did. Hasn't liquid green stuff been discontinued? Thanks - that's a really good idea. I often find that my blending on putty isn't as good as I've thought - but usually only after I've undercoated the model! Fantastic work again, Ana! In spite of this being your first time of creating INQ28 characters, I'd argue that you seem to have the technique down pat ;) In all fairness, though, I'd say your previous Necron models also count as INQ28 models, if only for the approach you chose and the level of character inherent in the models. Anyway, this guy is, of course, a fantastic reproduction of JB's style, and at the same time, you are also adding your own twist, which I love. It's also interesting how massive he must be, given the use of Goliath legs -- is he just a big guy, or did the Ordos provide some augmentations? Really looking forward to the rest of the retinue -- will the other models be based on pieces of artwork as well? Thank you! Necrons could count, but I see them only marginally belonging in my vision of Inq28 in the narrow sense. They have a different sort of flavour, so to say. Vasily is just a naturally large man. Funnily enough, of the three models for this project that I now have on my desk in various stages of completion, he is the shortest one. If perhaps due to his slightly squatting pose and my inquisitrix wearing high heels and hat. The inquisitrix is also based on a JB painting. The third character will not follow any one specific concept art, but will be in the same spirit. As for any further models, I haven't even yet made up my mind what sort of characters they are going be. There's plenty to choose from!